← What Lights The Fire? Kage Baker was always thrilled when she got advertising notices of her books. You know – flyers on new science fiction from the local indie bookstore. Or those “Just Like” and “Recommended for You” emails from amazon.com. From time to time, she’d get those; mostly because she looked up her own stuff on Amazon and of course the store’s vast cybermind kept a record of what she looked at. They never noticed the similarity in the names, because Kage never had an account with Amazon. She used mine. It can be a bit of a problem for anyone with a public persona; staying private and still keeping up-to-date. Kage solved it by approaching the majority of her contacts in the World Outside while using waldoes. I was the waldo. Mine was the name on most of the orders she placed online; she even used my name for a couple of chat rooms, after she got her first flaming … and I used her name, too, in many cases of suspicious correspondence and unproven chat rooms. I used to yell at her for checking the reviews and rankings on amazon.com too often. It always depressed her horribly. Someone sending a copy of a good review would send her into a dancing mania of joy and exhultation – one poor review, though, and she was ready to quit writing and spend her life bricked up in her bedroom. It never came to that, luckily. I would have refused to drive her to the hardware store anyway. Gradually, Kage got a better idea of how amazon.com did (and did not) work; there are repeat reviewers who seem to live only to spread pain and despair among authors. There are also reviewers so enthused about the entire process that they review everything – but they do so in such a slapdash, delusional way that one was hard put to believe they’d read the book in the first place. And rankings are based only on sales, not reviews; essentially, popularity being paid for by the pound. Overall, it tended to work out as a halfway-operational analogue. But only halfway – Kage learned to take the ratings and reviews less seriously. She never stopped sneaking on to amazon.com to check from time to time, though; and it sometimes took a couple of days to get over the resultant depression. Massive analyses and brain stormings on the current project, whatever it was, would be necessary to get her back in writing mode. And while in many cases the story was improved – well, the toll on the author was not worth it. Today, I opened my email and behold! A notice from amazon.com, informing me that, based on past purchases and look-ups, I might be interested in A*NEW*KAGE*BAKER!!!! Well, yeah. It wasn’t a surprise, exactly, but hot damn, yes, I’m interested! 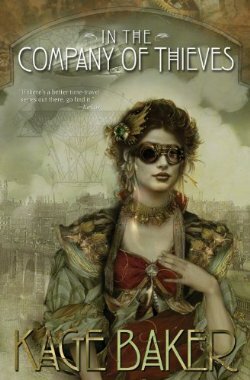 So now there is the formal announcement of In The Company of Thieves, and it will be officially released on October 1, 2013. In the meantime, it’s up and listed on amazon.com and is available for pre-order. At the moment, it appears to be available only as a paperback: but, from the inimitable Tachyon, that always means a trade paperback of high quality and great beauty. As you can see, the colour values seems a little cooler. I think it looks amazing. So there you are, Dear Readers – a new Kage Baker on the way. Only one story original to the book, but the others are rarely-collected stories and quite delicious. It’s my good news for the day, and I’m delighted to share it with you. Ordered it, with great pleasure. And yes, there are lots of goodies coming this autumn – I’ve got Dr. Sleep on preorder, myself. And I think the cover for this one is one of the prettiest ever. Looking forward to reading it, and Doctor Sleep and the Goldfinch. So much…(say it!) anticipation. What a gorgeous cover, and that outfit! Elegant and alluring. Excited. Mendoza! That has to be Mendoza! Can I get a poster size reproduction for my wall? Yep, I think it’s Mendoza, too. She also bears a resemblance to Kage, about aged 20 … the chin and the mouth. The hands. And the hair. I’ll talk to the artist, and see about getting you a poster.